1. Supporting Angles — 3 by 3 by 3/8 in. supporting angles attached to masonry with 3/8 in. diam by 1 1/2 in. long hex head steel machine bolts with steel washers and 21/8 in. long steel inserts spaced 18 in. OC. 2. Flashing Angles — 13/8 by 25/8 in., 20 MSG metal coated steel, 13/8 in. leg attached to masonry or wall with 1/4-in. diam 13/4 in. long steel masonry nails spaced 18 in. OC. 3. Wall and Partition Facings and Accessories*— Steel Liner Units — Min 20 MSG. 12, 16 or 24 in. wide steel liner panels of various shapes forming the interior side of the wall, attached to top and bottom supporting angles with No. 14 by 1 in. long hex head steel screws located 1 in. from the edges for 12 in. wide liners and at the midpoint and 1 in. from the edges for 16 and 24 in. wide units. 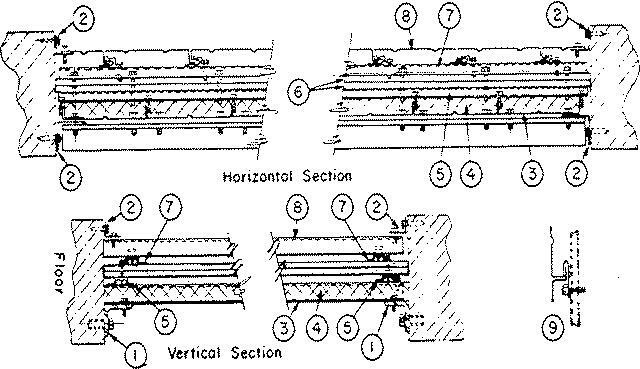 The standing side joints of adjacent liner units button-punched vertically 24 in. OC, or screw-attached 48 in. OC. 4. Batts and Blankets* — 1-1/2 in. min thick mineral wool or glass fiber batts. Installed in liner and/or fascia cavity with horizontal joints in adjacent cavities staggered. 5. Sub-girts — Hat-shaped, min 9/32 in. deep by 2-9/16 in. wide with 13/16 in. legs, No. 16 MSG metal coated steel attached to lips of liner units along the upper leg of the sub-girts with No. 12 by 3/4 in. long hex head sheet metal screws. Sub-girts spaced vertically not more than 48 in. OC with top and bottom sub-girts located not more than 3 in. from supporting angles. 6. Gypsum Board* — 5/8 in. thick by 48 in. wide sheets, two layers applied vertically, vertical and horizontal joints between adjacent layers staggered. First layer attached to sub-girts with 1-5/8 in. long Type S-12 bugle head steel screws. Second layer attached to first with 1-1/2 in. long Type G-10 double lead bugle head steel screws spaced 24 in. OC vertically. Screws located alternately 10 in. from the vertical edges for the first layer and 9 in. from the vertical edges for the second layer. GEORGIA-PACIFIC GYPSUM L L C — Types TG-C, Type X, Veneer Plaster Base - Type X, Water Rated - Type X, Sheathing - Type X, Soffit - Type X, GreenGlass Type X, Type X ComfortGuard Sound Deadening Gypsum Board, Type LWX, Veneer Plaster Base-Type LWX, Water Rated-Type LWX, Sheathing Type-LWX, Soffit-Type LWX, Type DGLW, Water Rated-Type DGLW, Sheathing Type- DGLW, Soffit-Type DGLW, Type LW2X, Veneer Plaster Base - Type LW2X, Water Rated - Type LW2X, Sheathing - Type LW2X, Soffit - Type LW2X, Type DGL2W, Water Rated - Type DGL2W, Sheathing - Type DGL2W, Type DGG, Type DAP, Type DS. PANEL REY S A — Types GREX, PRX, RHX, MDX, ETX. 6A. Gypsum Board* — (As an alternate to 5/8 in. thick wallboard in Item 6) — Nom 3/4 in. thick, 48 in. wide, installed as described in Item 6. 6B. Gypsum Board* — (As an alternate to Items 6 and 6A) Nominal 5/8 in. thick, 4 ft wide panels, secured as described in Item 6. 7. Sub-girts — Hat-shaped, min 9/32 in. deep by 2 9/16 in. wide with 7/16 in. legs, 18 MSG metal coated steel placed over wallboard with one leg located in line with the sub-girts on the opposite side and attached through the wallboard to the first set of sub-girts with No. 14 by 2 1/2 in. long hex head steel screws spaced horizontally 12 in. OC. 8. Wall and Partition Facings and Accessories*— Facing Units — Steel face units, min. 20 MSG, of various shapes supplied in 12 to 42 in. widths. The 12 in. wide units are attached to sub-girts with V-shaped 18 MSG coated spring steel clips hooked over the lip of the facing unit and screw attached to the sub-girt with No. 14 by 3/4 in. hex head self-tapping steel screws. Alternately attached to sub-girt with L-shaped 18 MSG coated spring steel clips hooked over standing lip of facing unit and screw attached to sub-girt with No. 14 by 3/4 in. long hex head self-tapping steel screws, standing joints then button-punched vertically 24 in. OC; or attached directly to sub-girts with No. 14 by 1 in. steel screws spaced a max of 10 in. OC horizontally. 9. Alternate Facing Unit Attachment Detail — Alternately, female lip of face panel attached to sub-girt with No. 14 by 3/4 in. steel screws.